An historic pencil factory in the Lake District is to move home after more than 170 years in Keswick. Allerdale Council has given permission for the Cumberland Pencil Company to relocate to the Lillyhall Industrial estate near Workington early next year. The pencil company said the factory was not modern enough, and most of the 100 workers would transfer to Lillyhall. The Cumberland Pencil Museum will remain at Keswick, and the old factory will be turned into housing. Barbara Murray, spokeswoman for the Cumberland Pencil Company, said: "The building we are in at the moment is not suitable for modern proposes at all. "We transport pencils up and down stairs all day and what we need is a purpose-built, on one floor and on one level, modern lovely, clean factory." 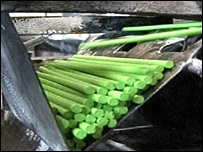 The factory produces 750,000 pencils a week, which are transported for sale to 75 countries across the world. Pat Notman, who has worked at the factory for 34 years, will retire when it closes early in 2008. She said: "I am sad - the factory has given a lot of employment to Keswick over the years."